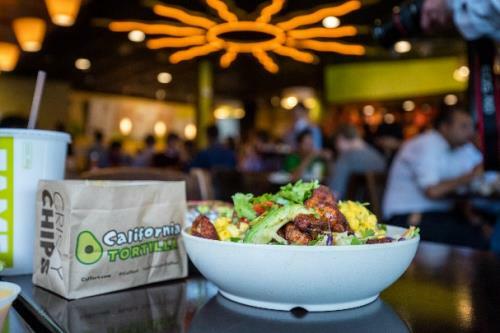 California Tortilla, a fast-casual Mexican-inspired restaurant franchise, is expanding its footprint and will introduce its farm-fresh dishes and innovative restaurant concept to guests in North Carolina, South Carolina, Tennessee, Kansas and Georgia. One will be opened in Chattanooga. Currently operating 42 locations across the mid-Atlantic region, California Tortilla expects to open a total of 8 new units by the end of 2019 with aspirations to hit 100 units by 2023. The franchise’s innovative offerings and commitment to using fresh and quality flavors has helped the fuel the brand’s growth and demand in new, booming markets. Three restaurants in Wichita, Ks. Five restaurants in Virginia Beach, Va.
One restaurant in Raleigh/Durham, N.C.
One restaurant in Chattanooga, Tn. California Tortilla serves burritos, bowls, street tacos, quesadillas and salads. Each restaurant is dedicated to serving farm-fresh, ingredients and everything is hand prepared in small batches daily in scratch cook kitchens. The innovative menu features 25 unique chef-created dishes, such as the Korean BBQ Burrito, Blackened Fish Street Tacos and California Sunset Bowl. Every California Tortilla features a Wall-of-Flame, a towering display of 75 distinct hot sauces, ranging from mild to tongue-melting, allowing guests to further customize the flavor and heat level of their meal. “Our brand’s devotion to fresh flavors and cult-worthy menu items has led us to develop a strong presence in the Mid-Atlantic region,” said Jim Tisack, vice president of Franchise Development at California Tortilla. “There are a lot of great real estate opportunities in other thriving markets that are attracted to our brand, which presents a strong opportunity for us to increase our geographic footprint”.